I occasionally have started dogs and pups available. Please contact me if you would like more information or have any questions. My pups are well socialized, current on vaccinations, and wormings. They are raised inside, handled daily and will also spend time in the kennel on nice days. The pups will be vet checked and on Heartworm preventative and microchipped. All dogs and pup will only be held with a deposit, the deposit is non refundable. 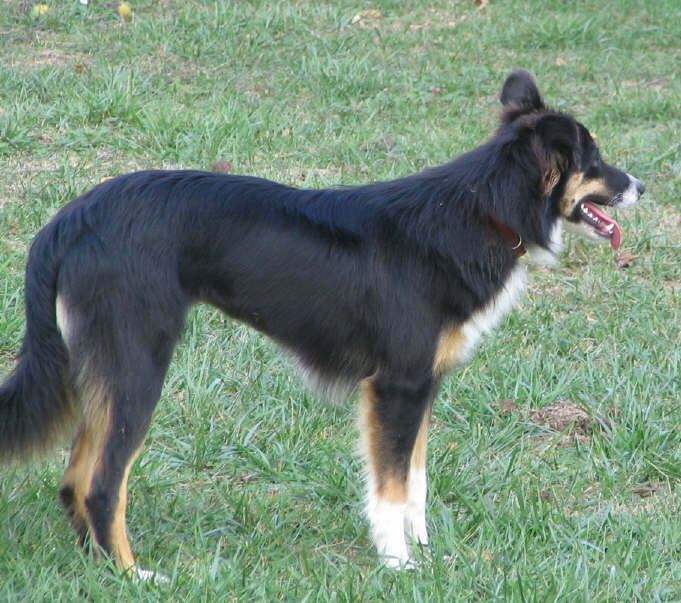 Occasionally I know of border collies that are more suited to sports or pet homes. 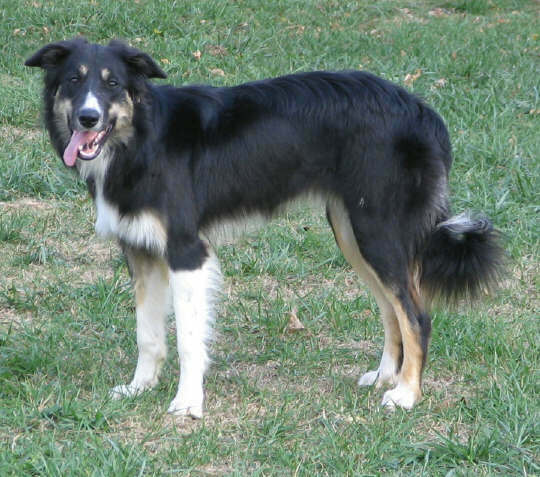 I have also taken in border collies that were in pet homes and trained them for working dogs. 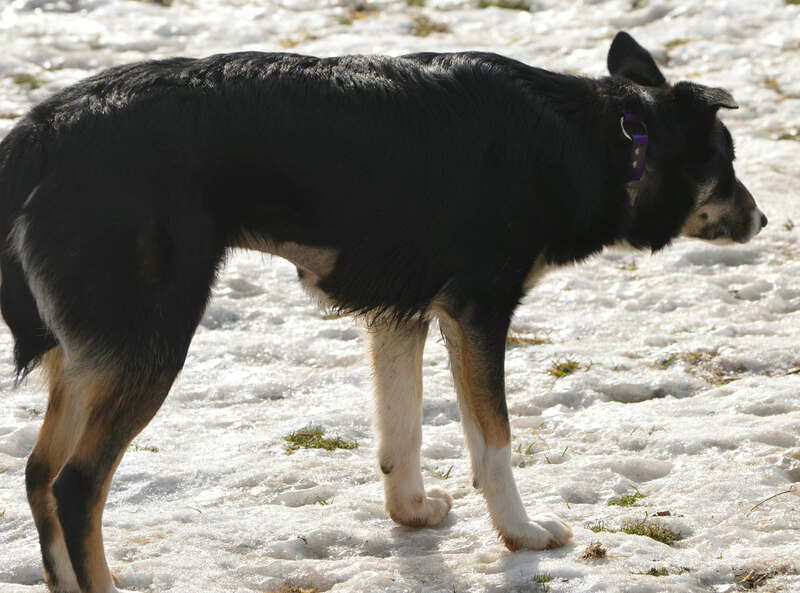 I would also be happy to put you in contact with other folks who might have a Border Collie to fit your needs. Give me a call to check on current pups or started dogs I may have available. Riggs loves every one, one of those dogs that has nrver met a stranger. 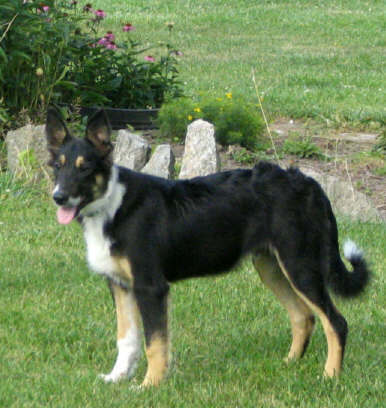 A Owen bred on botton, Cattle dog bred on top. Crate trained, house broke, lives inside and travels well. Sarah - B/W smooth coat Started on sheep. Going both directions, calling off well. Super sweet, enjoys people. I am offering GRIZ for sale to the right home. Reason - I have 2 young females from her. 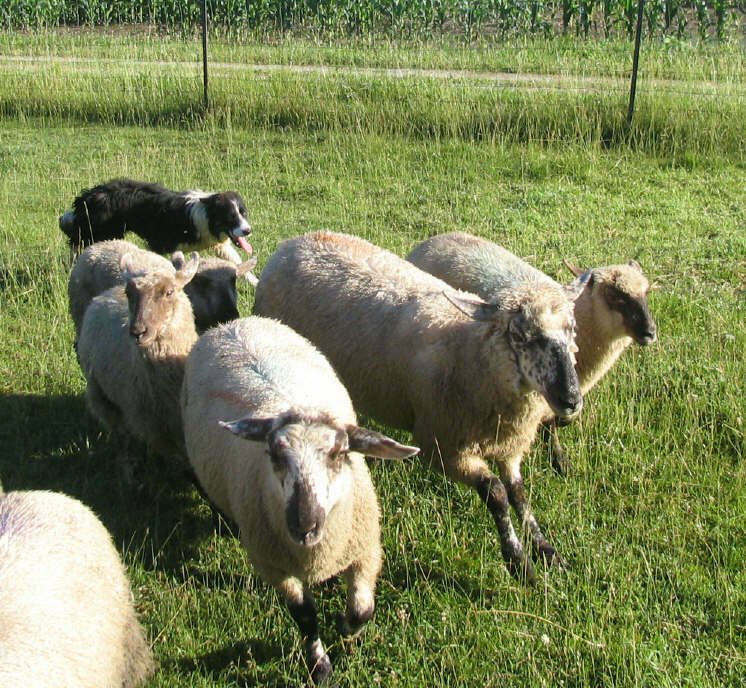 Griz is capable of being both a farm/ chore dog and a trial dog. She works well for both novice and experienced handlers. Very willing to please. Great gather, flanks and pace. Kind to her sheep, nice lines. I will sell one of the girls so if you are interested contact me. Both are very thoughtful workers and doing chores. Very natural easy dogs. More suited to farm/ranch work I believe. They work 3 sheep as well as they do 30. Outruns are good, good stop, excellent recall. Quite good at penning, starting to drive. Working in open fields and small places. Will work large group and keep with you walking or riding a 4 wheeler. Raised and kept inside house, crate trained, socialized ect. May be spayed before sold. Ivy now working in ID on the Rockingl4 ranch. Cora in training and progressing very well. Cora is working out in the open and doing basic chores. She has a great outrun and getting more consistent on flank command and driving a bit. She is shedding some also. Both parents are used for all chores on the farm. Meg has a natural outrun and handles the top well. Scott is very natural, plenty of come forward in him. Both parents have good hips and have had eyes checked. 8 mo old tri female, med coat ABCA reg. from the sheep and walks in nicely to move them. Fly is with me for some initial training. Off sheep she is a sweet girl, easy to live with and a fun little girl. She is leash broke, crate trained and good in her outdoor kennel. B/W Femal. Hope is a great dog to live with, loves people and good with other dogs. She is very athletic. Hope has natural flanks and wants to please. Nice, Natural and Confident. We are working on longer outruns, off balance work and driving. stopping off balance, taking off balance flanks and driving some. Great to live with and has a super personality. He is very classy on sheep. 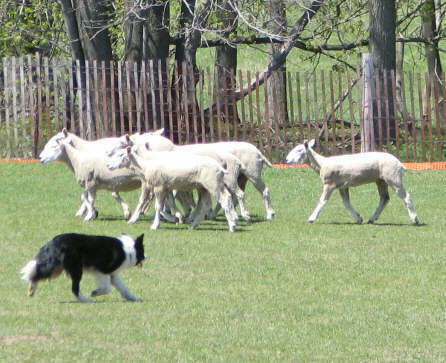 The pups started watching sheep at 9 weeks old and Echo is now able to work in the big field. Echo is also very interested in Ducks. She is going equally well both directions, has a lie down and walk up and going well off balance. She is very natural and wants to work. Echo will go into corners and along fences confidently bringing the lambs. She has worked groups of 3 to 20. We are working on a bit of driving and increasing her outruns. 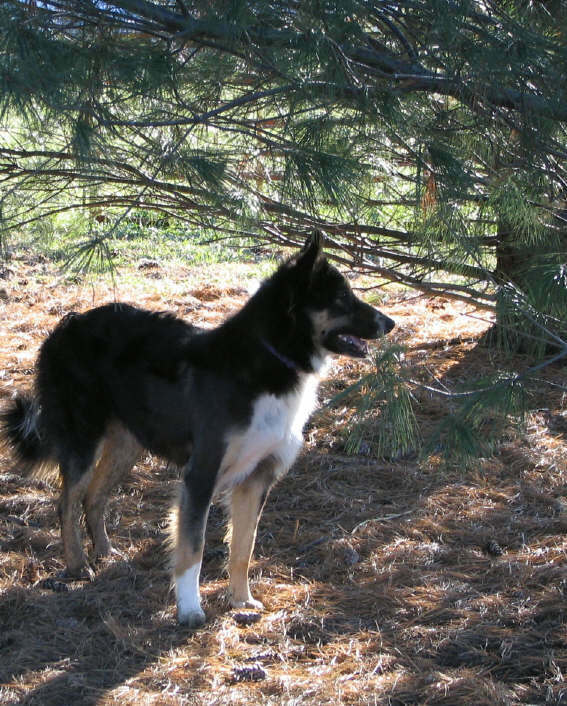 Echo has been worked by many novice handlers at the clinics and always works well for them and the clinician. She does not get novice folks into trouble and has lots of talent for the more advanced handler to continue on with. Working out in the large unfenced field since a year old. Pictures on the up and coming page. All dogs are vet checked, vaccinated and on heartworm prevention. Very well socialized, outgoing, and confident. I have decided to offer Aj for sale. She is easy to live with, house broke, does well in the kennel, good with most other dogs. She is super friendly, good with kids, great to travel with. She has nice flanks, is driving, has a good down, stand ect. She has been worked on sheep and ducks. She enjoys working ducks and swimming very much and would be a great goose dog. SOLD - Congratulations Dave and Susan. I am sure AJ will be a great addition to your family. Mick is being offered for sale to the right home. He is progressing well in his training and will make someone a super dog. He knows his directions, has a stop, stand down and a good recall. We are working on lenghten his outrun and driving some. He is rather loose eyed, will bring stock off fences or out of corners without hesitation and is very determined. Mick will be 2 years old in Feb 2009. Tess was the most adventurous of the females from the litter. She was watching stock at 5 mo old and is now working. directions,she has a stand and a recall at 10 mo. She is quiet on stock and loves to swim. Ben is going to be a big, stout male. If there was a GQ for dogs he could do the cover. Ben is doing very well in his training and has a quiet presence when working. He loves going places and meeting new people. 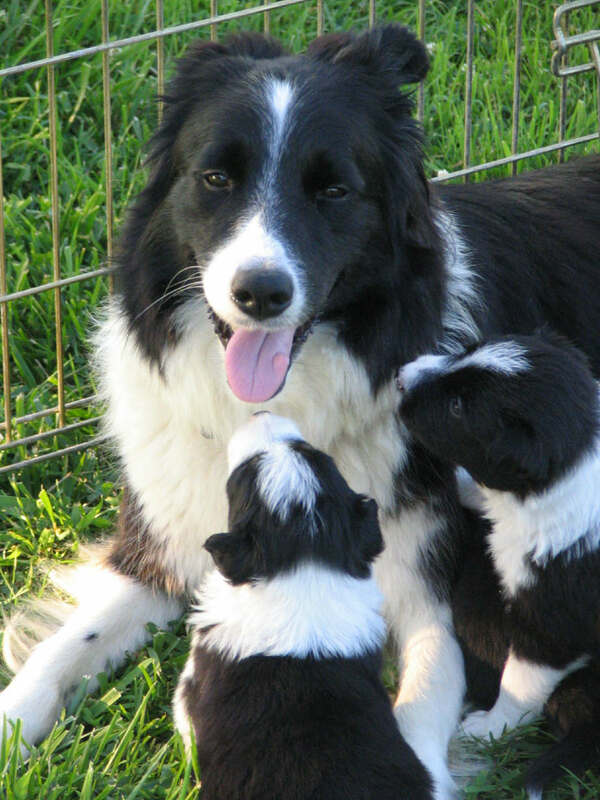 Please let me know if you are interested in a border collie and I will be happy to let you know when I have a litter planned or assist you in your search to find the perfect dog for you.